Chatting with my sister the other day about what we’d been eating lately, she told me about a quinoa succotash dish that she had from a local food truck. Sounds like something that would be fun to put together! 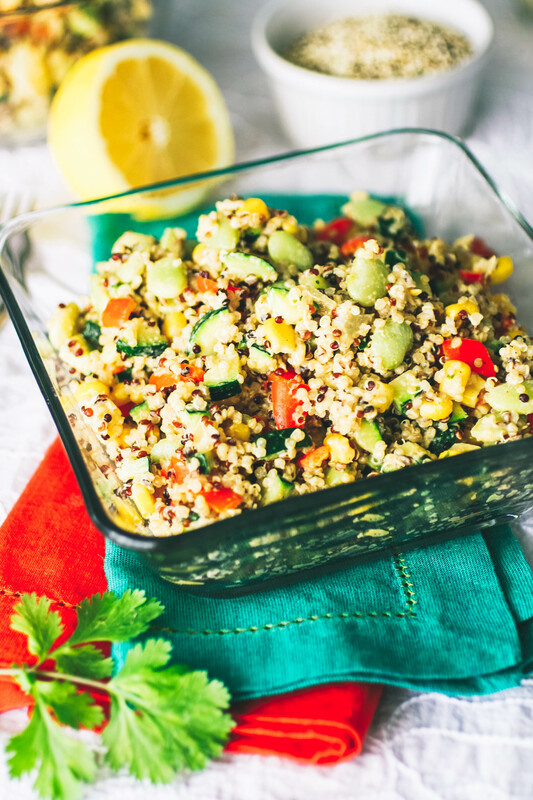 As I made my Quinoa Succotash with Spiced Tahini Dressing I couldn’t help but laugh at the voice of Sylvester the Cat in my head saying, “Sufferin’ succotash!” Who can say “succotash” without thinking of those old cartoons? I love quinoa so much that I sometimes have it for breakfast (or breakfast for dinner), like this Sausage, Sweet Potato & Spinach Quinoa Bowls with Egg. Mmm! It’s so filling and comforting. You can toss quinoa up in a salad like Kale and Quinoa Salad with Honey-Dijon Dressing, or use it to make a fabulous snack like Quinoa, Coconut, and Date Muffins that you can enjoy anytime of day. Did you know that quinoa is native to South America and though it’s referred to as an ancient grain, it’s actually a seed? Ya learn something new everyday (at least I did)! If you love salads and sides that are out-of-the-ordinary, give this recipe for Grilled Eggplant, Cherries, and Couscous Salad a try. It’s perfect when the weather turns warm! 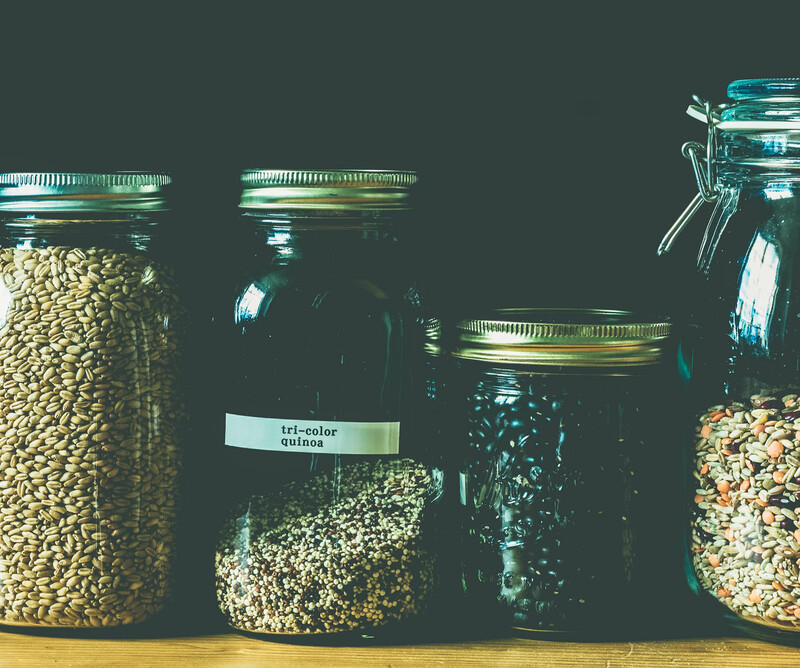 Quinoa is also high in protein and is a complex carbohydrate (meaning it takes longer to digest than simple carbs, and therefore, helps keep you feeling full longer), so it’s good for you, too. I love using tri-color quinoa made up of red, white, and black quinoa. To me, it’s sturdier than the white quinoa. Paired with a bunch of veggies and an addictive tahini dressing and you’ve got a flavorful, colorful salad or side dish to serve. 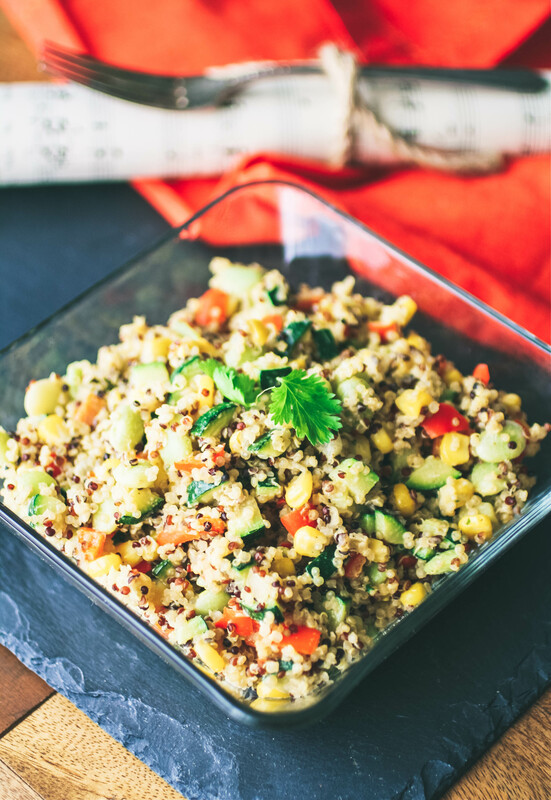 You’ll love Quinoa Succotash with Spiced Tahini Dressing for your next side! Serve Quinoa Succotash with Spiced Tahini Dressing at room temperature (the dressing helped to keep the dish moist), but you could serve it chilled, too. Be sure to reserve some extra dressing to drizzle over the top if you prefer to serve it cold. You’ll love how fresh and simple this succotash is. Whip up a batch soon to enjoy with any meal! Add the tahini, first 1/4 cup water, garlic, lemon juice, cilantro, ancho chili powder, salt, and pepper to a food processor. Blend until combined. If the mixture seems thick, add the reserved 1/4 cup water, along with the teaspoon of olive oil. Blend again. Taste and adjust the seasoning as needed. Set aside. Add 2 cups of water to a saucepan and bring to a boil. Add the quinoa and return to a boil. Add a lid to the pan and reduce the heat to simmer until the liquid is absorbed (12-15 minutes). Remove the pan from the heat. Fluff the quinoa, cover the pan, and let it sit for 10-15 minutes. Note: I used half this portion for this recipe and reserved the remaining quinoa for another use. Add the olive oil to a large sauté pan over medium heat. When hot, add the onion and cook for about 4 minutes. Toss in the zucchini, Lima beans, corn, sweet pepper, salt, and pepper and stir. Cook for about 5 minutes, stirring occasionally, or until the vegetables are warmed through. Remove the pan from the heat. Add about 2 cups of the quinoa to a large bowl and fluff it with a fork. Add the vegetable mixture, then drizzle about half of the tahini dressing over the mixture. Toss to combine. Add more dressing if you’d like. Save the remaining dressing to add to any leftovers. Just made this delicious recipe for lunch and it was delicious. Thanks for sharing this. I love the tricolored quinoa too. It's so pretty! And that Spiced Tahini Dressing sounds so good!! What a beautiful dish! Hi Kacey! Great when everyone can enjoy the same dish! Thanks so much! Such a great salad, love that you used tahini in the dressing. I am using tahini more and more in recipes. Such a great flavor. Thank you, Amy! I really need to use it a bit more - I love it! As a kid, I loved that "suffering succotash cartoon, but really disliked the real thing. This version however, I could learn to love. The idea of spicing up quinoa and adding tahini dressing are both wonderful - and the combination is genius. Hi - I know, Laura! It always seemed mushy and bland. Glad you like this option - hope you'll get to try it! Hi Ramona - thanks so much! I just love this dressing with it! Love it! This would make such a great Thanksgiving side (can't believe it's almost Thanksgiving time again!) - everyone would love it! I know! It's hard to believe, Sarah! Thanks so much for stopping by! Oh that looks good. A fabulous dish for lunches at work. Much more interesting than a sandwich. Great idea, Jacqueline! This would transport nicely for lunch! Thanks so much for stopping by! WOW! What an awesome inspiration from a food truck! Love that you made this! So good! I know - hard to imagine! Thanks so much, Kristen! This is such a fun side dish. I am loving that tahini dressing. I bet it pairs so nicely with this. I really want to like quinoa, but it is usually bland. This sounds fantastic and I need to give it a try! I agree, Sarah - it is pretty bland on its own. I hope you try this - I think the tahini dressing adds a lot to the dish! Thanks for stopping by! This looks deliciosu! And I love Bob's Red Mill. I actually got to meet Bob at the natural products expo this year! He was so nice :) I'll have to give this a try! Super cool, Liz! That makes me love Bob's Red Mill products even more :) Thank you! 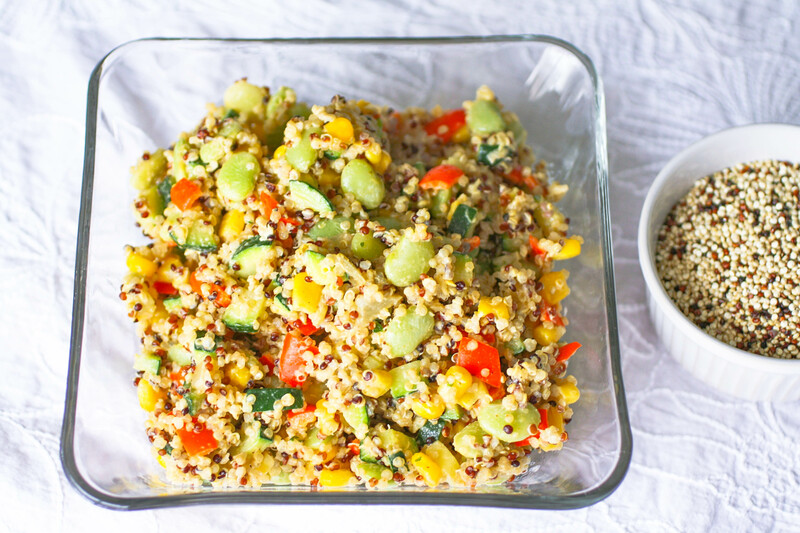 I love quick quinoa salads like this! And that dressing! YUM! If I wasn't allergic to tahini I would be all over this! Aw, bummer. I'm sure you could whip up a fab dressing to replace it :) Thanks! Quinoa is a fantastic salad base! It's got fantastic flavor and texture! For sure! Thanks for stopping by, Sabrina! I'm so glad I'm not the only one who regularly chats with my sister about what we're eating. haha! This looks great! I love the flavors you paired with quinoa. It took me a long time to like it. This is a recipe that even people who are fond of quinoa will love. I love quinoa salads, and that spicy tahini dressing sounds incredible! Can't go wrong with quinoa! Thank you, Kristina! This quinoa looks amazing! So pretty! thufferin' thuccotash, that looks good! Haha! It's hard to resist, right, Dorothy? Thanks so much! Tahini dressing seems to be in trend now -- and for good reason! The stuff is the bomb! Thanks for sharing this amazing recipe! I'm happy to follow along ;) Thanks for stopping by & hope you give this dish a try! I love tahini dressings! This sounds so good and I definitely need to make this :) Thanks for a great recipe! Thanks, Vanessa! I love tahini dressings, too. I hope you give this a try! This looks delicious, love all the flavors and I love the sound of that tahini dressing! I love tahini dressings and I really need to get some of that ancho chili powder, yum! This recipe has so many of my favorite things. Thanks! Hope you try & enjoy, Linda! Thanks! Thanks so much, Sina! Glad you like it! Thanks so much, Gin! I appreciate it. Hope you enjoy! I love all the delicious veggies, and the dressing sounds perfect with them! Such a delicious lunch, dinner, or side! Hi Cathy! Thanks so much - yes, this dish is great for a variety of servings! I make something like this all the time when I need a quick and easy veggie lunch. I love it. Hi Dannii! For sure this is a satisfying and easy-to-make meal. Thank you! Lovely pictures Patricia. You have a lovely blog. Thank you so much for your kind words, Remya! Not that's fusion. What a wonderful combination of foods! Sounds delicious. And there is always a need for that side dish that will sit on the buffet and stay good. This should be perfect. Thank you, Anne! Hope you have a great holiday! Hahaaa! Yes, it *is* fun to say! Thanks so much for your kind words! I'm always looking for a recipe to use Tahini and this is finally the one I get to try! It's a really pretty dish! Oh, awesome! I hope you and your family like it! Thanks very much! 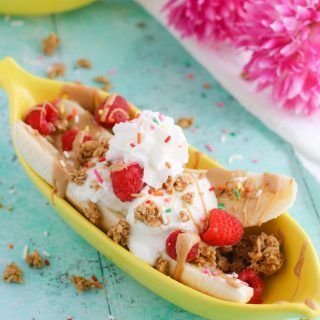 Oh my gosh, I need to make this soon! It looks incredible, love that it is vegan and GF too since I have a few friends and family with those dietary restrictions. Thanks so much, Leigh! I'm so glad you'll have some friends to help enjoy this dish! What a clever idea and fun twist! 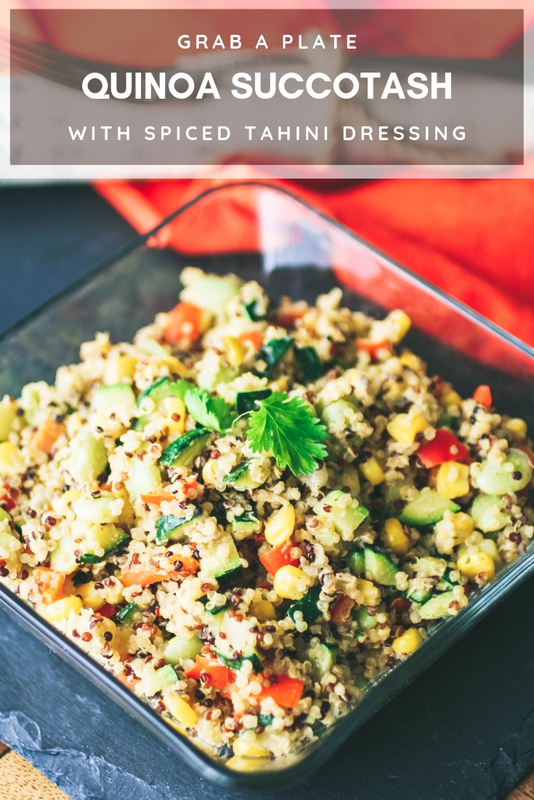 Adore quinoa and tahini - I will definitely have to give this a try soon! Thanks so much, Alexandra! Enjoy! I've never even heard the word "succotash" before - and I am yet to try anything tahini flavoured - but this looks really good! I know how good quinoa is supposed to be for you, so I try to have it at least once a week, but I do keep having it with the same meal which can get boring. I'll have to put this on the to make list! Thank you, Indya! 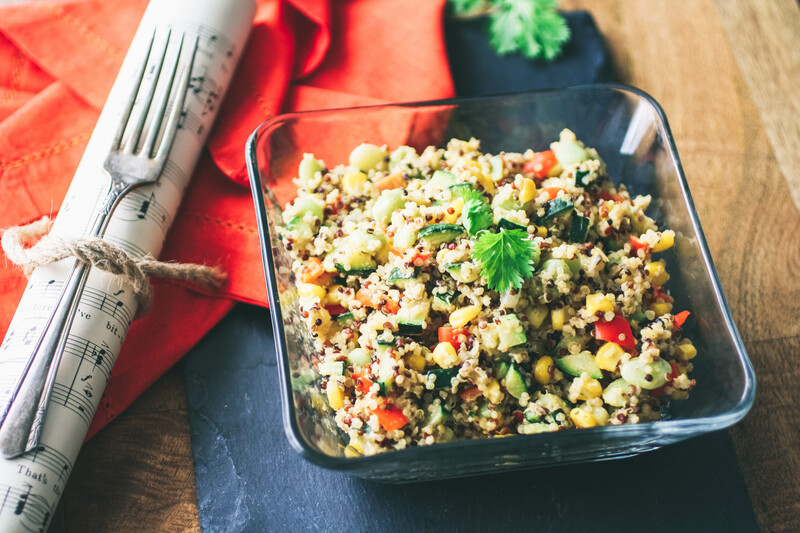 Yes, quinoa is for sure a good-for-you dish! I hope you try this one soon, and enjoy! Looks amazing. Will try it for dinner tonight. Thank you, Hina! I hope you liked it! This looks delicious and perfect for our next extended family gathering. I think everyone will like it. Thanks, Beth! Yes - it's a great side! This looks delicious! I love quinoa. I haven't had tahini too much but when I have I've enjoyed it! Thanks, Becky! Do try it! I bet you'll enjoy this dish! Just saved this recipe for later! I make your steak/corn fajitas ALL THE TIME! I definitely need to try more recipes from your site -- that one was a huge win with my house! Thanks so much, Monica! I hope you try this and love it! Your recipes always look so delicious! I've recently become obsessed with quinoa recipes so I'll have to try this one out. Thanks for your kind words! I hope you'll love this one, too! This look really good. A good refreshing dish, and perfect for the summer. I'll have to try this! Thanks, Maria! I hope you like it! This is going to be so refreshing for summer. Ahhhh! For sure - a good one for the warm weather. Thanks!